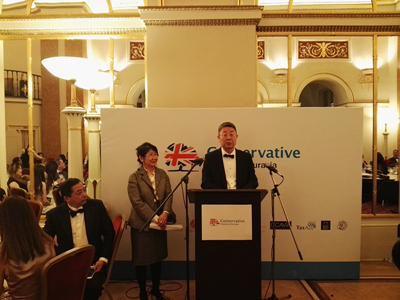 On December 11, Minister Ma Hui attended the Christmas Gala Dinner hosted by Mrs. Bota Hopkinson, Chairwoman of the Conservative Friends of Eurasia, and delivered a speech. Nearly 150 people attended, including British Conservative Party Members of Parliament: Jeremy Lefroy, Bob Blackman, and Paul Scully, representatives of the Chinese Community, as well as His Excellency Erlan Idrissov, Ambassador of the Republic of Kazakhstan to the UK, Vilen Murzak, Charge d'Affairs a.i. of the Embassy of the Republic of Moldova, and other diplomats in London. Minister Ma said that the Belt and Road Initiative is China's major move to integrate into the global economic system by building a new pattern of opening up to the outside world in an all-around way. It is also a public good that China has offered to the world as we meet development challenges and work for sustainable development. This is in line with the trend of times and conforms to the common aspirations of the peoples of the world. The Initiative will not only help China achieve stable, balanced, and inclusive economic growth, but also create tremendous opportunities for China and the outside world, including Eurasian countries, to achieve mutual benefit and common prosperity. Ma expressed the hope that both China and the UK can enhance their policy coordination, give full play to their respective strengths, deepen result-based cooperation, and make contribution to jointly building the Belt and Road Initiative. In their speeches, Ambassador Idrissov, Jeremy Lefroy MP, and Paul Scully MP hailed the Belt and Road Initiative as a great unifying force for enhanced cooperation, which will vigorously promote the sustainable development of the countries involved, Eurasia and the world as a whole. The British guests at the event said that in the context of Brexit, Britain needs to step up its efforts in the Belt and Road Initiative to actively expand economic and trade cooperation with China and other Eurasian countries so as to achieve mutual benefit and win-win results.